...but white has never been my colour. I never understood why in the Spanish IT consultancy where I used to work, we called those drafts with new ideas “white papers”. As if a fresh start wasn’t hard enough; facing a blank page (or canvas) called “white” emphasises that terrifying moment before anything takes place. The moment of nothing, the empty space, what is yet not there. The whole idea of whiteness, in relation to creation, is just off putting. Instead, I would like to focus on what is about to happen. And call them simply “ideas papers”, or “butterfly papers”, to encourage those ideas to fly. Or maybe, “dream papers” to bring in the lightness of what doesn’t necessarily have the pretension to become real. 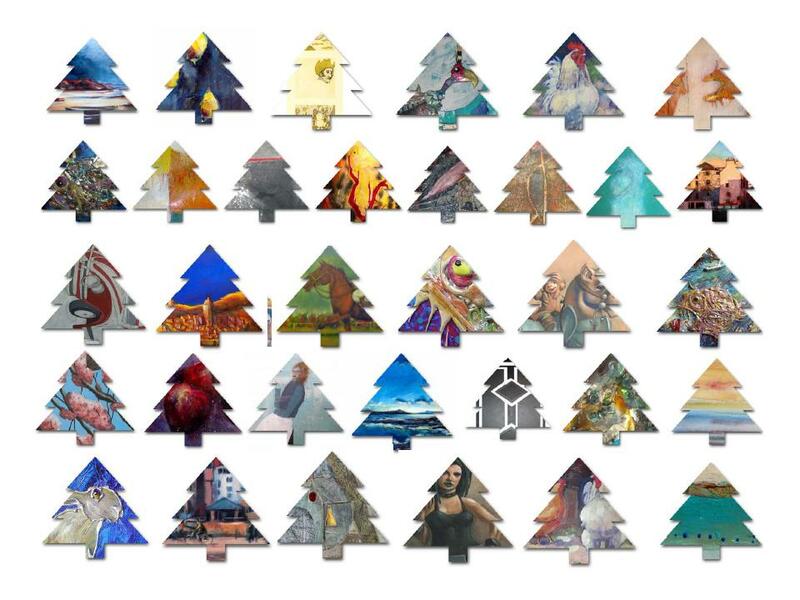 Or, better still, I’d call them “recycled papers” not because of their ecological value, but to stress the idea that pure originality doesn’t exist; that any new creation is actually re-creation and re-elaboration, drawing inspiration from the past. So, while the “white paper” seems to be detached from the world, like an orphan, a beginning and an end in itself; bullying the shaking author with the written version of “if what you are about to say is not more beautiful than the silence, do not say it”; the recycled paper is warmly received into the world. It assumes its tiny place into the Universe, it puts the writer in their place and lightens up the burden of having to take that small but huge step of …CREATION. And while the “white paper” gives you only the one chance, and demands a line at a time to make a perfect final piece; the recycled paper invites you to stain it, cross it out and, often, go back to the beginning and start anew. It is part of its circular charm, as mastered by outstanding creators like Picasso, who used to do dozens of drafts before arriving at a masterpiece. So, like an artist friend who uses only second hand canvasses, I now try to use anything but white paper. I use the back of old shopping lists and bills. Outdated post-its and “to-do” lists: “lived paper” that is already part of the cycle. Borrowed paper or adopted paper, humble, unpretentious paper…even forgotten paper. But no, never white paper. 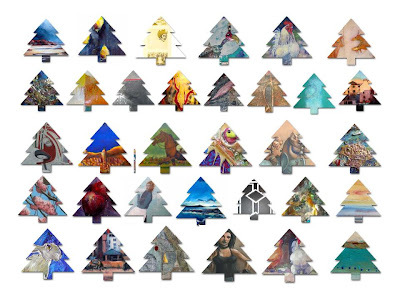 So, when time comes, let me wish you a colourful Christmas instead! 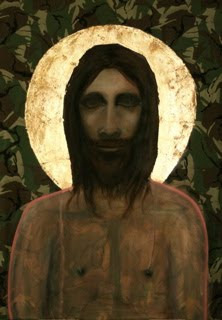 The new exhibition at Joseph Pearce's Bar presented the warm, Mediterranean palette of artist Fee Dickson. 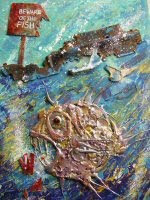 In Christmas 09 Artmag published the suplement "Buy Art for Christmas" which featured one of Kate Lloyd's solder & acrylics fish. Okay!! ...So it was not the summer that we all had expected. The crows were wrong, wrong, wrong. And so was the Met Office, which had forecasted a warm and dry summer. Instead of a “BBQ summer” with temperatures above 30, it turned out to be wetter than average. In fact, there were 42 wet days with Dumfries and Galloway, home to Edwin Slater, one of our regular artists, registering its wettest August since rainfall records began, back in 1914. But then, who wants predictions when it is often unexpected things that make life exciting and make us smile? As Sarah Duncan says, there is nothing like accidentally putting a dry-clean only top into the wash and discovering it comes out perfectly, or spotting a new green shoot in a plant you thought was done for. For me it was finding that my Spanish cooking book does not have the recipe for “Tortilla de Patatas” as surely, if you are Spanish, you are expected to know how to cook it from birth!, or finding a huge feather in the toilet of an airplane (during my last easyjet flight to Madrid). Yes, things are more appreciated when you don’t expect them at all, when they are out of context. Like having a brilliant idea while waiting for the bus, or having a shower. Apparently proximity to water is very inspiring, says Henriette Anne Klauser. It’s something to do with the negative ions as they stimulate brain activity associated to creativity. So be pleased for the rain. I wonder whether this has something to do with the amount of talent in these wet-lands which exceeds the reservoirs of galleries and has flooded cafes and restaurants near you…to get you by surprise. Just like a warm sunny day at the end of September when you were getting ready for more rain. Join us this coming Sunday to see what our artists have been up to during all those 504 hours of inspiration and tons of negative ions. 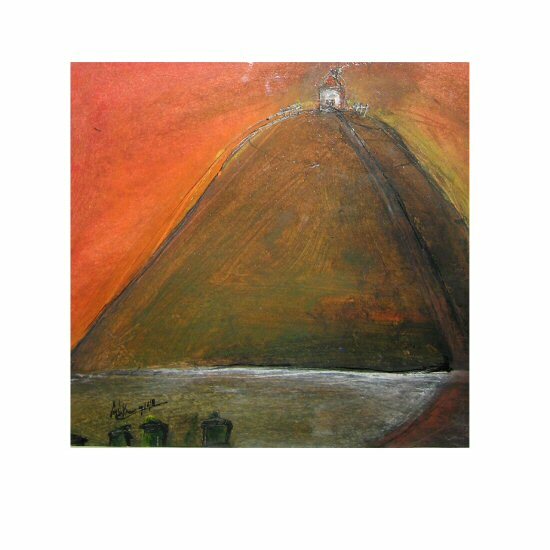 Below: "The Auld Kirk", by Edwin Slater, mixed media. Delicartessen.co.uk is today launching its Festival Exhibition at Joseph Pearce's Bar in Edinburgh. The Exhibition, which includes a wide range of media including slate, collage and solder work by local artists, also includes a mysterious painting brought from Inverness for the show. "Seeing is Believing is inspired by a picture my father used to show us when we were children of Jesus with his eyes closed. He told us that if we looked hard enough - and if we believed in him, we would see his eyes open! I tried to re-create that face from my memory and it was weird when I was painting him, as I was looking right into the eyes of Jesus, trying to paint his eyes open and yet shut, which was quite intense. I had painted an under coat of red to go under the gold halo - and just as I looked Jesus in the eyes and he looked back with open eyes, the red paint came down in a stream from his head (as if blood from the crown) which is still there and it was a very strange moment for me, as I was alone in the studio at night!" 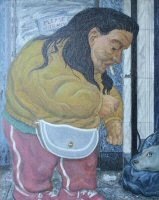 "The exhibition definitely has something for everyone, with an amazing range of materials being employed; from fish bone and feathers in Kate Lloyd's solder work, to pants and locally found deer hide in Newman's paintings. And the strong sense of interaction with the environment is highlighted by Rosie's "Seeing is believing", where she invites the viewer to participate in this "seeing-believing" game of her childhood memories and be part of the mystery surrounding the painting's creation". "I dont believe in Jesus, as such, any more- but there is an element of 'wanting' to believe in 'something' that we all have and how much wanting to believe in something makes it real? I painted it on camaflouge as the Iraq war was on my mind and the whole issues of using religion as a reason for war and blindly believing in that." The Exhibition runs until the 30th of September at Joseph Pearces Bar. Delicartessen is a small Edinburgh based company that promotes the art of young and emerging artists and organises exhibitions in different venues in the city. Since 2007 it has been organising the art exhibitions at Joseph Pearces on a regular basis. Although I was taught not to ‘mix’ mediums at art school and to limit myself to one art form, I have never been able to stick to this. I am fascinated by the endless variety of materials available and during my career I have produced a diverse body of work, using doors, ironing boards, performance and also canaries. Currently my paintings follow a theme of repetition versus uniqueness and this includes studies of wallpaper patterns, a series that uses the formal floral print. I use the texture or the paint to ‘set it free’; the pattern dissolves and/or changes, through painting, as though nature has claimed it back. (As with real wallpaper, when it fades and peels and the layers of the past are revealed and mixed with the new). I like using practical and utilitarian images and putting feeling, wildness and nature back into them and vice versa. I have worked a lot with painting items of clothing and shoes, particularly my daughters red shoes, which I find symbolic and emotive. I have painted them over and over; to me they reflect the passing of time and the joy of the individuality within the mass-produced. I like flirting with pattern, leaving the symmetry and then returning to it. More recently I have found a good source of deer hide from a forester and have been using it to paint onto. 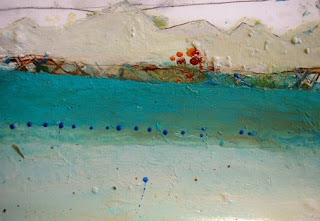 I find that it relates directly to the local landscape and it contains within it, a sense of ‘bringing back to life’. Festival 09 Exhibition at Joseph Pearce's Bar. with works by Inverness based artist Rossie Newman & John Cannavan's tribute to the highland cows! ...have a look and judge for yourself! "House on the Hill", "Girl in the Forest"...they all could have been titles of tales you've heard. On Monday 22nd of June 2009 we launched our summer exhibition at The Jazz Bar. as part of our Summer 2009 Exhibition. Leith Festival and presented new additions to our show. 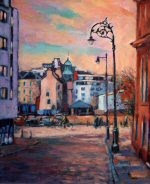 It depicted a collection of work as eclectic as Edinburgh's most eccentric district. ...Just when you thought that you had seen it all in Leith! And someone told me recently that this is the sign of a very good summer ahead. The first summer I spent in Scotland after arriving from Madrid, in 2002, was exceptionally good. “It’s not always like this, so don’t get too used to it..!” some friends advised me wisely to enjoy the gift of sunshine without taking it for granted, for duller times might follow. And I soon learnt to appreciate the courage of a ray of light breaking through the clouds against all odds. Delicartessen was born in a rainy March, so it is used to storms and showers. It is powered by the torrential flow of talent I have encountered by chance, and committed to allow our artists shine in their own right …whatever the forecast.Two years later, you can see them sparkling at Joseph Pearce’s Bar. After its facelift Scandinavian style, this corner of Leith is blossoming into an all-day den for regulars. We do our previews on Saturday mornings to make the most of its crisp, natural light. And on a more cave style note, perfect for winter or Scottish days alike, we also exhibit at The Jazz Bar. Owner Bill Kyle keeps the venue buzzing…7 days a week. Its music programme even reaches high altitudes as I have come across several reviews about it in different in-flight magazines. No wonder Bill has 1.800 subscribers to his own newsletter. Previews are on Monday evenings, so there is no excuse to say these are grey days any more. And you can always stay and let the band of the day please your ears afterwards too. The current show at the Jazz Bar, “Material-istic” refers to the 3D nature of the works on show and to the financial crash…but with a twist. Although financial cycles can bring unpredicted downpours which suddenly take you by surprise and leave you feeling damp, and intangible products like shares can drop to zero and freeze your heart in a second, with a painting you know that, no matter what, you will always have something to hold and keep you warm inside. Let’s hope the crows have been wise!! “The Spring Exhibition” includes works by Edwin Slater, John Cannavan, Kate Lloydd and other invited artists. "Beware of the Fish" by Kate Lloyd. Solder work, bone & acrylics, 58 x 40 cm. 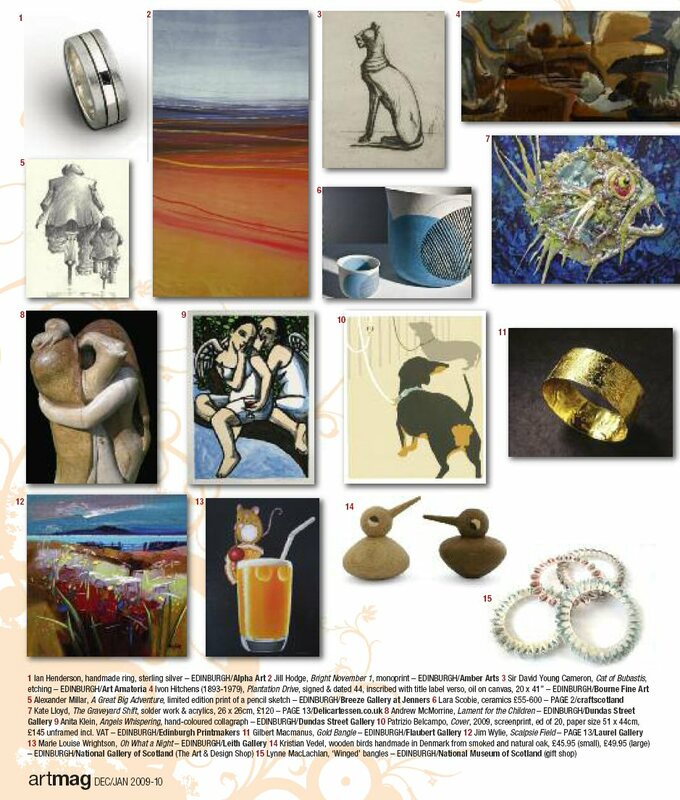 "I am pleased to invite you and your guests to the preview of our Spring Exhibition at The Jazz Bar. Material-istic is a 2d/3d show with solder works by Kate Lloyd, slate works by Joshua Jack and oil paintings by Ronald Buchan. Farewell to the winter blues and begin Spring with an event that, surprisingly, has nothing to do with the finantial crash and a lot to do with texture, colour and shape! "Rolling Stones" by Joshua Jack. Slate, 40 x 40 cm. 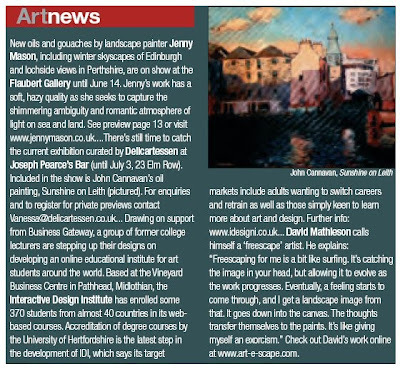 In 2009 we recruited new artists like John Cannavan whose paintings of Edinburgh and Scottish landscapes became regular sight at all our existing venues at the time. And on 5th of March we lauched a new exhibition that also included works by Ronnie and Edwin. "Soul Mates" mixed m. 60 x 80 cm. "Woman with cigarette" oil ,50 x 40cm. After a short break to recover from all our hectic activities around Christmas time, we welcomed the new year with a Solo Exhibition by Irish artist Jacqui Higgs. "My Current practice involves on-site drawings, photographs and graffiti text sourced from the industrial spaces of urban and contrasting rural landscapes. 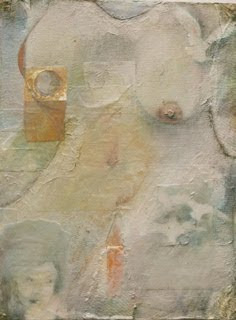 These are then developed to create a multi-textured surface..."
This painting below is my all-time favourite by Jacqui. Due to the layer of varnish covering the canvas, the foggy quality of the "snow" is appreciated only when you see the painting in the flesh.